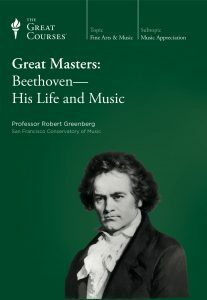 Dr. Robert Greenberg, best selling creator of audio and video courses for The Teaching Company/The Great Courses since 1993, is now offering those courses for direct download, right here on RobertGreenbergMusic.com! These courses are crafted and produced for lifelong learners and offer a learning experience that goes far beyond anything that can be achieved merely by placing a camera in a classroom. How to Listen to and Understand Great Opera. This series offers a broad survey of the single most important genre of Western music to have emerged over the last 400-plus years, opera. Music as a Mirror of History presses home the point that since the High Middle Ages, Western music has been both a reflection of, and a metaphor for, the larger culture norms prevalent at the time of its composition. Great Music of the 20th Century picks up where How to Listen… leaves off, and offers a detailed examination of the music of the 20th Century. This course category consists of the 10, 8-lecture courses in the Great Masters Series. Each of these courses focuses on the life and music of a different composer: Haydn, Mozart, Beethoven, Robert and Clara Schumann, Liszt, Brahms, Tchaikovsky, Mahler, Stravinsky, and Shostakovich. These courses focus on the lives, times, and musical stage works of three operatic masters: The Operas of Mozart, The Life and Music of Verdi, and The Music of Richard Wagner. This course category focuses on repertoire composed for specific musical genres: The Symphony, The Concerto, The 30 Greatest Orchestral Works, and The 23 Greatest Solo Piano Works. These courses focus on repertoire by specific composers: Bach and the High Baroque, Concert Masterworks, The Chamber Music of Mozart, The Symphonies of Beethoven, The Piano Sonatas of Beethoven, and The String Quartets of Beethoven. Whatever their particular content, all of Greenberg’s courses are informed by the truism that context is everything. Musical “style” – the generalized “sound” and expressive norms of the music of a particular time and place – is a function of the larger cultural environment (the “context”) of that time and place. 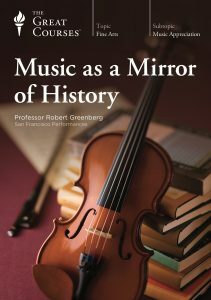 As such, music history is indivisible from cultural, religious, economic, and technological history, and thus each of Greenberg’s courses discusses music in the context of a broader social history. What Will You Need Before Getting Started? Robert Greenberg’s courses were created for the interested listener, and require by prerequisite only a willing ear and an open mind. 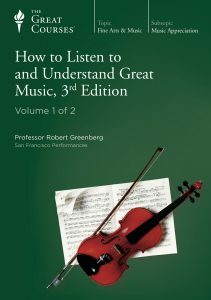 All courses downloaded from RobertGreenbergMusic.com come complete and with all written materials and companion guidebooks in PDF format, unlike The Great Courses purchased from Audible and many other affiliates.